Human resources is a dynamic and inspiring profession that is forever innovating to acclimate to our changing world. Using strategic goal setting, resource management and development, and training techniques, human resource managers support both individual employees and the organization’s culture. Professionals in the human resources field must be willing to evolve with these changes, and that means staying current on best practices. 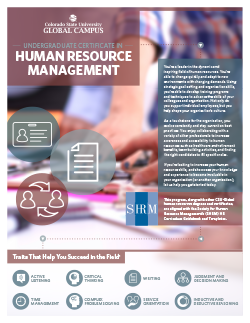 Additionally, our human resource management certification is aligned with the Society for Human Resource Management’s (SHRM) HR Curriculum Guidebook and Templates. If you don’t have previous work experience or an education in human resources, an undergraduate certificate and SHRM certification can show employers your skills and knowledge so you get the job you want.